Sometimes the simplest recipes are the best, and you don’t need to fuss with ‘em or try to make them better. Instead, simply changing how they’re presented works wonders. Such is the case with cookie pie. I’ve been using the same chocolate chip cookie recipe for a few years now and we’ve been really happy with it. Why fix what isn’t broken, right? 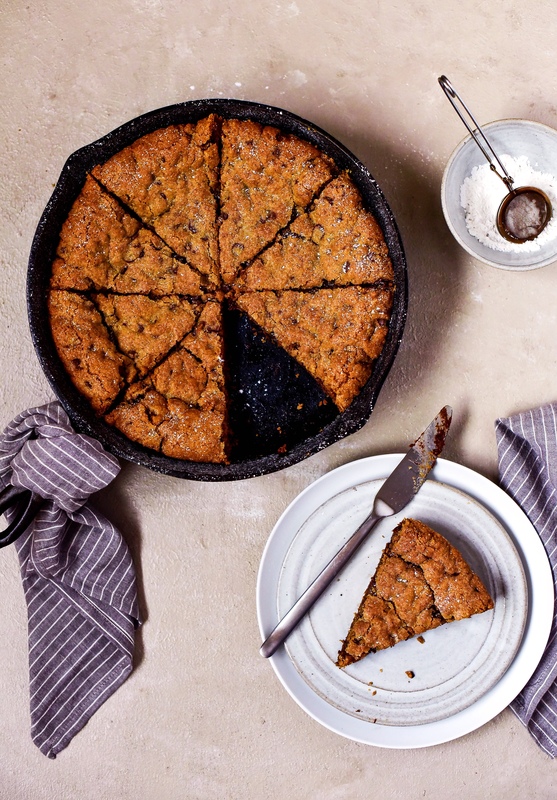 It’s got the perfect mix of white and brown sugars that allow for a wonderfully crispy yet chewy crust, and the right amount of salt that really enhances the flavors of melty chocolate chips and cookie equally. I love having a go-to chocolate chip cookie recipe in my back pocket. Extra points go to this recipe because I can almost cook it by memory (and that’s saying a lot). But cookies, especially those you have to roll out by hand and place individually in perfectly aligned rows to allow for maximum perfect exterior crust formation, are sometimes just a bit too time-consuming. I’m no baker. Frying up a handful of diced onions and garlic in olive oil tugs at my soul and livens me up. But in my older years, I’ve developed a sweet tooth, and these fit the bill. I’ve figured out a way to take about 30 mins of cookie preparation down to maybe 10 minutes. And the only forethought required for this recipe is to let the butter come to room temp. I give you: cookie pie. In order to convert a cookie recipe to bake as one whole pie, the timing and cook temps need to be adjusted. Lucky for you, I’ve figured out a good estimate for this one and I’ll share in the recipe card below. But, as oven temps vary from kitchen to kitchen, I’d suggest you keep an eye on your first one and make sure to pull it once the crust is slightly browned and it’s puffed up a bit. 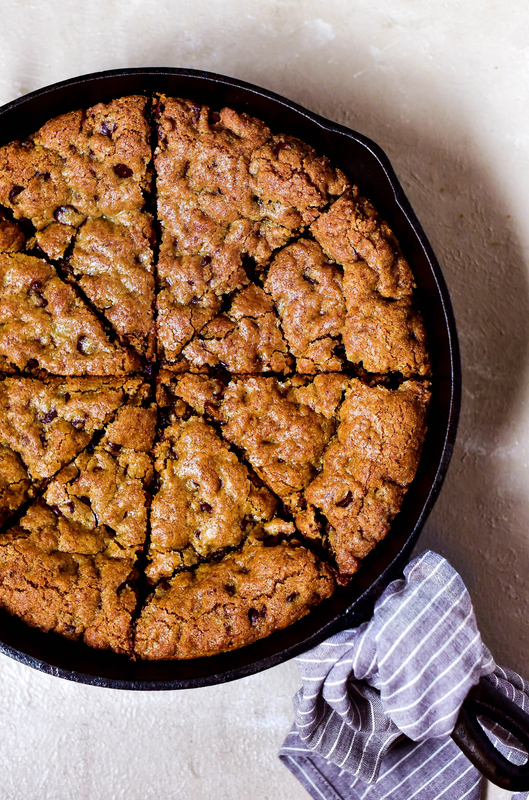 I recommend making this cookie pie in a heavy cast iron skillet. That’s what I use and I haven’t experimented with different bakeware because it works damn well and it’s what I have. And because you’re using a cast iron skillet, you don’t need to oil it before placing the dough in. The same way you shouldn’t have to grease a baking sheet for chocolate chip cookies (because of all the butter), you don’t need to grease this either. It’s best to remove the cookie pie as soon as it looks slightly browned and puffed up. A little under is better than over in this case. The nature of cast iron means it retains heat really well. So, it will continue to cook your cookie pie once out of the oven. Once you remove from the oven, wait about 10-15 minutes, and it will have firmed up enough to transfer onto a serving dish in one whole piece. And even though I don’t usually do this, I highly recommend serving slices of cookie pie warm from the oven with a healthy scoop of vanilla ice cream on the side. OH MAN. You mean you have leftover cookie pie? Really?! I make this recipe once or twice a month and it keeps really well in the fridge (especially if you like more of a cookie dough texture). If you want to leave it out on the counter, it’ll keep for about a week in an airtight container before it starts to taste a bit dried out. I usually cut it into small pieces after baking so we can snack on little bites throughout the week. But it’s also really nicely presented in actual pie slices like photographed. Watch out though, it’s really rich! I hope you enjoy this recipe because it’s a winner in our home. Let me know how it turns out for you in the comments. 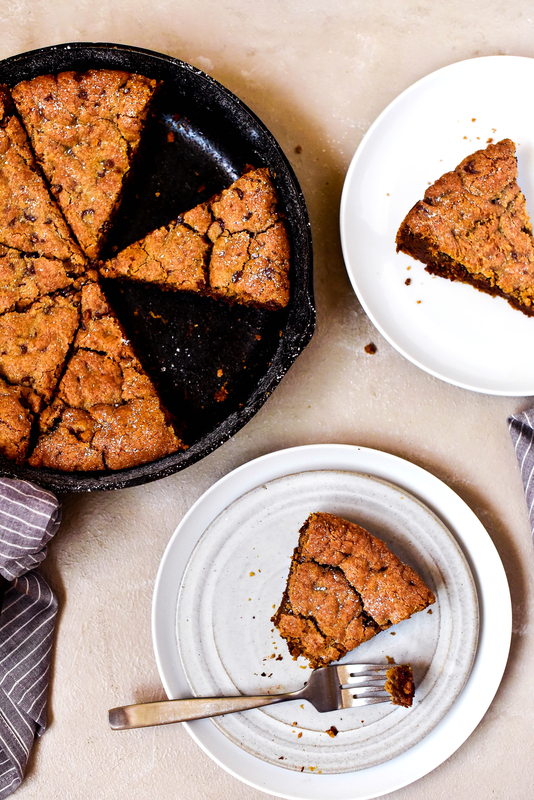 Cookie pie is my favorite hack for a quick chocolate chip fix. A simple chocolate chip cookie recipe comes together in a fraction of the time. In a mixer or by hand, beat together butter, egg and vanilla until light and fluffy. In a large bowl, add the rest of the ingredients (flour, baking soda, salt, chocolate chips, brown sugar, granulated sugar) and stir well to combine. Add the dry ingredients to the whipped butter and stir slowly until dough comes together. 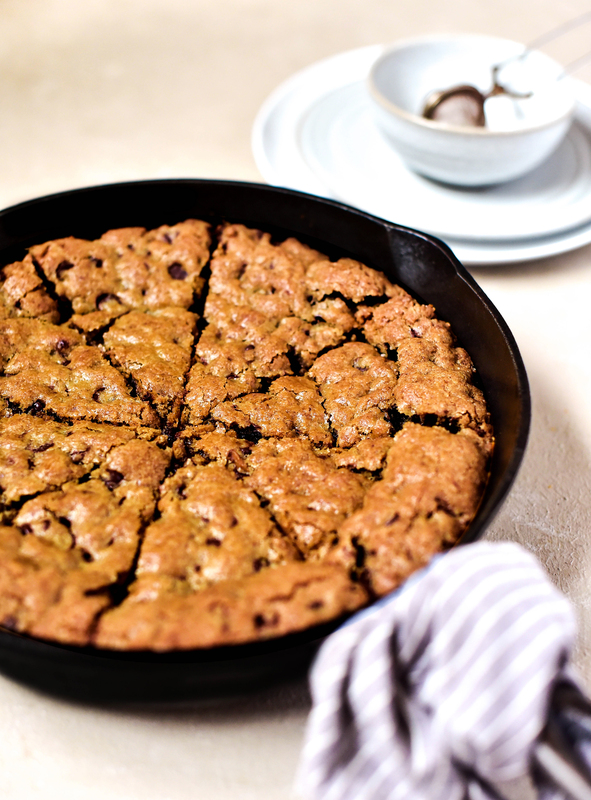 Place cookie dough into a 10 3/4" cast iron skillet and spread in an even layer with your hands. Bake for ~25-30 minutes or until the "pie" is puffed up and slightly golden brown. Remove from oven and let cool 10-15 minutes before transferring to a plate. If you want to use this recipe for cookies, it makes about 4 dozen. Bake at 375 degrees for 9-11 minutes.